QUB3D (pronounced "cubed") is an arcade minigame in the HD Universe appearing in Grand Theft Auto IV, The Lost and Damned, The Ballad of Gay Tony and Grand Theft Auto V, however it is non-interactive in the latter. The main goal of the game is to match up colored blocks into groups of four or more before they fill up the box, similar to Puyo Puyo, except the blocks actually "tumble" down when positioned vertically, akin to a Slinky; as the player acquires a specific amount of points, the game moves up a level. Orange blocks are introduced from level 15 onwards. The red "Special" removes the lowest four rows of blocks. The green "Special" removes the middle two columns of blocks. The blue "Special" allows the player to remove all blocks of any selected color in the box. The player must press the same button or key that activated this ability again to select a color. The yellow "Special" momentarily stops the any new blocks from falling on its own, allowing the player to control its descend on their own accord. A minor drawback to this feature is that the player can only hold a maximum of 3 choices of special abilities at a time. 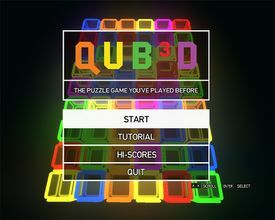 Beating the developer's high score of 10,950 points earns the "King of QUB3D" achivement. The player must complete this for completion. A back room in Perestroika, Broker. The Triangle Club, Northern Gardens, Bohan. St. Mary's Community Project in Bohan. However, the player cannot access the machine since the interior is only visible during cutscenes. QUB3D shamelessly declares itself "THE PUZZLE GAME YOU'VE PLAYED BEFORE" in its main menu, alluding to the fact that puzzle games of the visual matching variety are all very similar. During Mafiya Work in GTA IV's multiplayer, players may be tasked to destroy QUB3D arcade cabinets. A QUB3D arcade cabinet in The Triangle Club. This page was last modified on 26 March 2015, at 08:41.